Fish Sauce is a sauce made by fermenting various types of fish (usually anchovies) and pressing to extract the liquid. 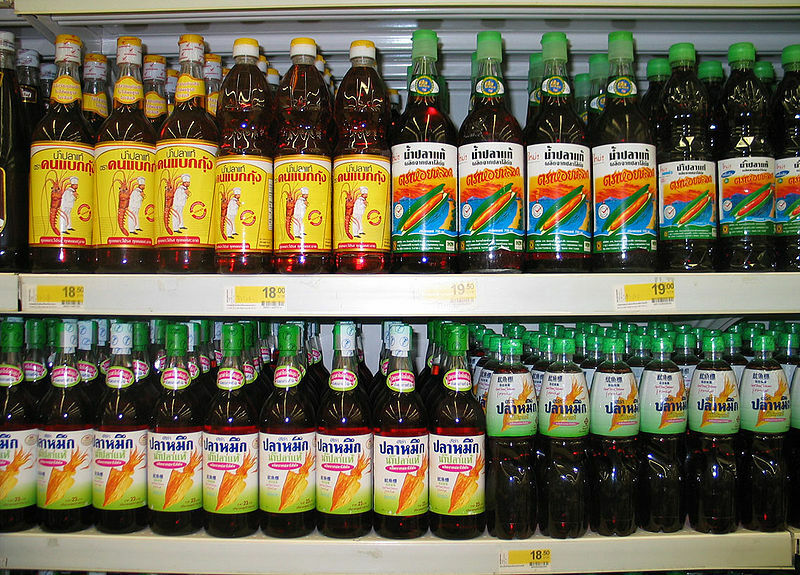 Left: Fish sauce in a Thai supermarket. Fish sauce is very salty and has a strong flavour, not just of fish (due to the fermentation process). It is an essential ingredient in many South-East Asian recipes. Is is also used as a basis for many other sauces. Because there is so much salt in these sauces, it can be used as a replacement for salt in a recipe. It also makes a very tasty salad dressing, but should only be applied at time of serving because the salt will make the salad wilt.